Sri Lanka’s Postal Department, which has been incurring multi-billion rupee losses is blowing away billions as salaries to its army of workers, its performance report reveals. Once the revenue is splurged on salaries, there is not much left over for investment to improve public services. But the top management is unmoved and unaccountable. The union says staff are faced with tough work conditions and blame mismanagement for the continuing losses. The department operates under Minister Abdul Haleem and runs 4,600-plus offices including 653 post offices. In 2015, the department’s salary bill rocketed by Rs 2.21 billion to Rs 10.71 billion compared with revenue of Rs 6.71 billion. This was a year when the department delivered yet more losses of Rs 5.04 billion. This loss was nearly double the loss in 2014. In other words, the losses mounted by Rs 2.21 billion from 2014. More than 91% percent of its expenditure in 2015, was on salaries. The salary bill even exceeds the revenue from stamps in 2015. The soaring salary bill has been attributed to increases which were granted by former finance minister Ravi Karunanayake, under the populist polices of the Sirisena-Wickremesinghe Government. In 2016 alone, the department, which is under Minister Abdul Haleem, continued to bleed red ink, booking a loss of Rs 5.7 billion for the year. Revenue in 2015 inched up to Rs 6.71 billion, while the expenditure ballooned to Rs 11.75 billion, up by 18.8% from the year before, according to its annual report. This means that the expenditure rocketed by Rs 2.21 billion in 2015, from the year before, simply because of salaries. Capital expenditure was just Rs 196.3 million for basic facilities and training, the department says. The biggest revenue generator in 2015 was stamps which brought in Rs 2.27 billion, but this revenue shrank from Rs 2.58 billion from the year before. The losses have been soaring every year. In 2011, the deficit was Rs 3.33 billion. Post Master General Rohana Abeyaratne attributed the losses to rising salaries but said the misuse of overtime claims was also a contributory factor. In 2016, revenue fell by 1.97%. In 2014, revenue grew by 2.3%. 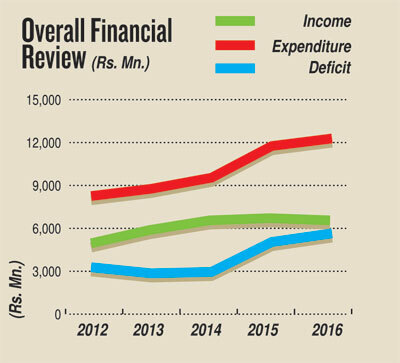 Compared to 2015, revenue shrank by Rs 133 million last year. The biggest revenue loss was in the speed post category which amounted over Rs 155 million while the stamp revenue, one of the major sources of revenue plunged by Rs 117 million last year. However, the revenue from international mail has increased from Rs 161 million to Rs 366 million, or by Rs 205 million. In 2016, revenue from the Central Mail Exchange increased by 1.52% but expenditure grew by 6.5% compared with 2015. The highest expenditure increase was in transport at the CME, rising from Rs 181.68 million in 2015 to Rs 888.55 million last year, which is a 389.15% increase compared with 2015. Although 1,270 workers were recruited last year to fill 2,382 vacancies in 2015, the overtime and holiday payments have increased by more than Rs 135 million in 2016. A Postal Department source said sometimes a postal vehicle will travel hundreds of kilometres to deliver a single letter, incurring losses. “A postman who reports to work by 7 a.m. starts delivering letters by 9 a.m. but his work for the day is done before noon. Earlier, there were times when postmen delivered letters twice a day,” the source added. He added that regardless of the massive network of post offices, it takes the department three to four days to deliver a registered letter in Colombo. He added that union protest activities have a significant impact on the department’s services. Post Master General Abeyaratne said the although the department can be profitable, the mandate is to provide a service. He admits that there is misuse of overtime payments by the Central Mail Exchange staff. He said there has been growth in business mail, international mail and the registered mail. And he also said it was unfair to highlight losses based on financial data. Rather, a comprehensive analysis, was needed, he said. “More than Rs 19 billion is paid annually as pensions and charity monthly allowances such as elderly allowance, allowances for cancer, Thalassemia and leprosy patients, through our post offices without a service charge and even using our vehicles. But no one is appreciates or talks about the positive social impact of our service,’’ he complained. However, Jagath Mahinda of the Lanka Postal Services Union, said postal workers have to undergo numerous difficulties because of a lack of basic facilities for staff.